In the renovated convent of the Roman Capuchins of Via Vittorio Veneto, as well as a multimedia conference room and reception rooms, a museum has been created that collects and exposes some significant aspects of the Capuchins in general and of Lazio in particular. It was opened to the public on June 26, 2012. The Museum and the Sections The Museum was founded with the intention of making the spirituality of the Capuchin Friars Minor known and, therefore, traces its history, presenting the life of Capuchin Saints exemplary as, for example, San Felice da Cantalice and San Crispino da Viterbo, but also contemporary figures of huge public resonance such as San Pio da Pietrelcina, stigmatized for 50 years and Father Mariano da Torino, first multimedia preacher, Father Gianfranco M. Chiti, former general of the grenadiers, back from the military campaigns of Greece, Albania and of Russia (retreat of the Don), a prisoner in the fields of Coltano and Laterina, wise and holy educator of innumerable groups of soldiers and then of young Capuchins. Eight rooms and sections of the Museum. The first section is dedicated to the Convent, commissioned by the Barberini family in 1626 and completed in 1631, as an extended convent complex with the church dedicated to the Immaculate Conception and according to the project by Capuchin architect Fra Michele da Bergamo. The second section presents The Order, one of the most widespread in the world, combining the paintings of the General Fathers and archival documents with some insights on the saints and Capuchin convents of the Roman Province. The third section, La Santità Cappuccina, focuses on Capuchin spirituality through the images and stories of some saints of the Order. The fourth section, the largest of the museum by extension, highlights the culture and spirituality through the display of garments and objects of liturgical use and that of artifacts for everyday use. The fifth section focuses on the “San Francesco del Caravaggio”, a work created by the great artist specifically for the Capuchin Convent. As Claudio Strinati states, Caravaggio throughout his life is interested in the figure of St. Francis in a series of works that mark his entire career. But the particular attention to the world of Capuchins is clear from the testimony of fellow painter Orazio Gentileschi who, in a deposition in Court in the year 1603, during a trial brought in Rome by the painter Giovanni Baglione against Caravaggio and others for crimes of defamation, told the judge that he had lent some time before to Caravaggio a robe of cappuccino so that Caravaggio could serve it. It could be deduced that Caravaggio had painted or was about to paint just one or more pictures of a subject, precisely, Franciscan and Capuchin in particular, before or just after that date of 1603. Here is represented the moment of the complete spiritual transfiguration of the saint who, taking the skull and kneeling on the bare earth, formulates the supreme gesture of placing the skull on the base of the Cross represented in the foreshortening to give it greater evidence possible in the bare environment, almost a cave, where the event takes place. Through the sixth section, I Cappuccini in the twentieth century, where there is a special focus dedicated to the Venerable Father Mariano from Turin, and the seventh, I Cappuccini in the world, the exhibition path reaches our days showing something of spiritual, cultural activity , missionary and artistic that characterized the Order in the twentieth century: documents, materials and archival works of some Capuchin religious propagators of the Gospel were presented, who used ancient and new instruments, techniques and forms of communication. At the end of the exhibition, the eighth section introduces the final and highly evocative place that closes the visit of the museum: the Crypt-Cemetery. 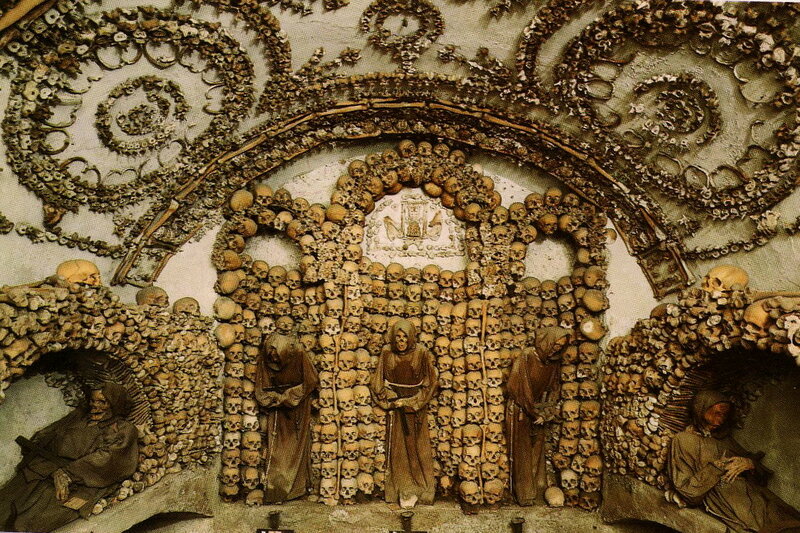 Unique work of art, built in the mid-1700s, with ornamental motifs on the vaults and walls, using the bones themselves of the religious. It is a brilliant composition that becomes an excellent opportunity for the positive announcement of the Christian meaning of human life and of its arrival at the Resurrection.